Home » Uncategories » What, Exactly, is a Friendly Missionary Baptist Church? 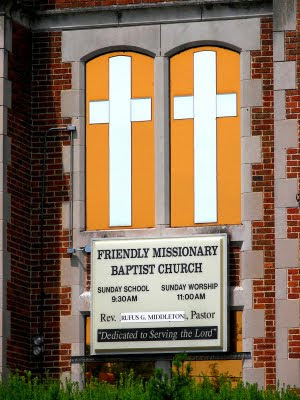 What, Exactly, is a Friendly Missionary Baptist Church? I know little about Friendly Missionary Baptist Church on Parkside in Toledo, but I found the name of the house of worship worthy of a chuckle. After all, considering the options, would one expect a missionary to be anything BUT friendly? "Surly Missionary Baptist Church" or "Angry Missionary Baptist Church" do not have quite the same ring, do they? Anyways, there appears to be quite a network of "Friendly Missionary Baptist" churches around the country, though I am unable to find a governing body or central organization for the group. Nor can I find any Friendly Missionary churches with a home page that explains the history behind the name, though admittedly I only went about eight search pages deep before giving up the quest, getting distracted by research on malignant mesothelioma. Feel free to leave in the Comments section anything you know about Friendly Missionary Baptist churches, either here in Toledo or around the country.